This cube makes life easier in many ways: it is easy to use and it saves the grower time, money and effort. If you want to know the 'hole' difference. CANNA has developed a specially designed hole which causes the cube to expand faster than you have ever seen before. Especially when used in combination with the packaging of the cube. The packaging is in fact a bag in which the cube is designed to be soaked or wetted. No more endless stirring and waiting for the coco to finally be ready for use. With this development, CANNA has been able to eliminate the downside that comes with the use of cubes. CANNA COCO can be re-used several times which saves time, money and effort. The packaging of each separate cube is in fact a bag in which the cube is designed to be soaked or wetted. No more extra aids, such as buckets, tubs or containers are needed. Just open the bag, add water and the coco is ready. To make life easier for the grower, the bag has grip handles which makes it very easy to carry the prepared coco to pots, bags, beds or wherever you want it to go. Due to the compressed nature of the cube it takes up very little space which in turn makes it very easy to transport and store. CANNA COCO is RHP certified for professional horticulture. This means it meets even higher requirements than other media that are RHP certified for consumer use (or not certified at all). The RHP for Horticulture certification guarantees a clean and pure product that is free from weeds and pathogenic organisms and is suitable for professional use. In order to qualify for possible RHP certification the coco must be either steam sterilized or the production process must be fully controlled. Steam sterilization is easier and less expensive and therefore the choice of most manufacturers. CANNA avoids steam sterilizing because of its many disadvantages. One is the mediums' loss of the ability to naturally protect crops against harmful moulds like Pythium. Steaming also converts plant usable Nitrate nitrogen to plant toxic Nitrite nitrogen. Steaming also changes the structure of the coco and as a result it retains more water, which is not a good thing. CANNA choose not to steam sterilize but rather to fully control the production process from the moment the nut drops from the tree. It is possible, therefore, to offer a product that still has desired beneficials that have strengthening properties. CANNA COCO is washed, buffered and therefore ready for use. Washed: Because coco palms grow near and on salt water, coco tissues contain large amounts of ions or salt. Salt can be very detrimental to plants when the occur above certain concentrations even though they generally are considered plant nutrients. In order to make coco suitable as a plant growth medium it needs to be washed. CANNA COCO is washed thoroughly with clean water so there is no need to rinse it yourself. Buffered: Coco has what is considered a negative CEC (capacity of the substrate to retain and exchange water and nutrients). The nutrients provided by the grower will be taken up by the medium and will not become available to the plant . This undesired effect must be prevented. In order to permanently stabilize the chemistry of the medium and its pH, CANNA has buffered its coco medium to make sure that the nutrients you give will go to the plant. One CANNA Coco Professional Plus Cube will make 20 liters of coco medium. But in case you have the desire to make smaller portions you can very easily break the cube due to the fracture line in the middle. This enables you to make two equal amounts of 10 liter. 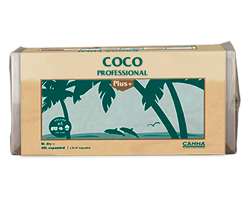 CANNA Coco Professional Plus Cubes are packaged per 2 cubes of 20 liters. One CANNA Coco Professional Plus Cube package makes a total of 40 liters of CANNA COCO medium. 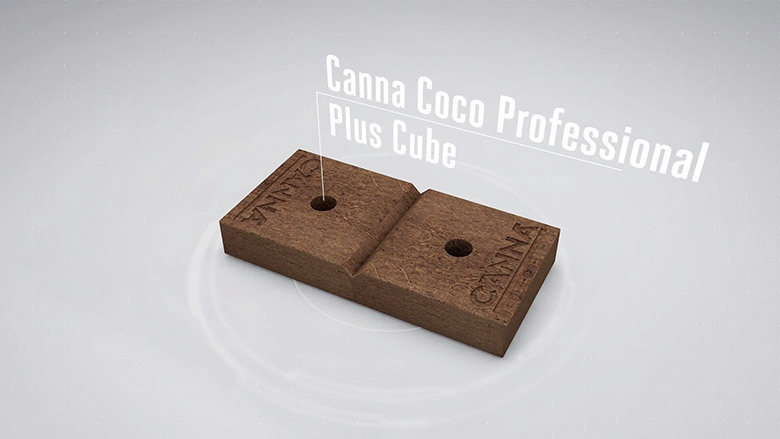 This CANNA Coco Professional Plus Cube is the exact same high quality as the much desired loose fill CANNA COCO. This means it is made from the highest quality ingredients. It is washed and buffered, not steam sterilized and RHP certified for horticulture. The buffering process allows CANNA to “pre-program” the medium to a certain age. This ensures the same consistent, high quality medium time after time. The composition of coco components blended together offers the best water-air ratio. CANNA COCO medium matches perfectly with CANNA COCO nutrients. Due to the special characteristics of coco and the applied washing and buffering process, it is possible for CANNA to combine vegetative and flowering nutrients in one nutrient mix. This means the nutrient can be used throughout the growing cycle and there is no need to worry about the proper time to convert from grow- to bloom nutrients. CANNA COCO is a fantastic plant growth medium, offering many advantages to both the gardener and his plants. CANNA COCO is, manufactured from coconuts grown in India. During the production process, the quality is monitored continuously, to ensure a high-quality product. CANNA COCO is a natural product with a homogenous structure. CANNA COCO is free of harmful viruses and soil-borne diseases. 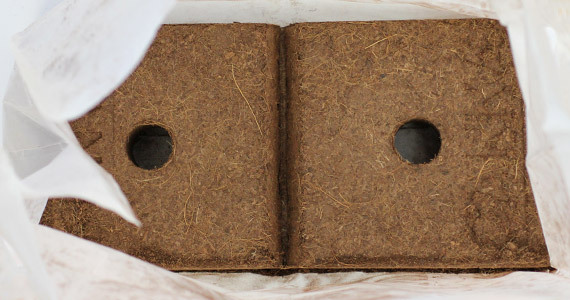 The coconut pith fiber contains a complex water/ air mixture, which provides an ideal environment for almost every breeding method. CANNA COCO is re-usable and ultimately it can be disposed of in outdoor garden areas. Water as required with the special CANNA Coco A and B fertilizer. Adjust container size if containers dry down to slow or if impossible to manually apply daily. Adjust the system to apply irrigation with nutrients, to 20% drainage, when 50% of the crop has used or loss 50% of the water the container can hold. About 5 liters of coco fertilizer solution per m2 a day (for full-grown plants). For bigger plants use a minimum of 5 liters. Using a larger pot provides you with a more stable root environment. Keep in mind, you will want to provide sufficient drainage in your pots. Use a thin layer of clay pellets, or stone, at the bottom of the pot for proper drainage. CANNA COCO coconut pith fiber is a high quality product. Its texture, porosity and purity make it and excellent grow medium. Furthermore, the coconut is pre-treated during a special process. This is necessary to obtain an optimal growing condition, assuring the best development potential of your plants. Use CANNA COCO with the appropriate fertilizer and you know you are investing in quality and consistency!